As spring gives way to summer, the Saturday afternoon appeals come more frequently: “Daddy, can you play in the yard with us?” Since I’ve done a poor job of teaching my girls the basics of catching and throwing, the preferred activity for outdoor fun-having usually entails a combination of running, jumping, and tickling. At ages ten and eight, D. and K. currently serve as the creative, energetic core of our family’s recreation department. They often beckon me to the trampoline for a rollicking session of “tickle monster” with three of their younger sisters. Lately though, we’ve been playing a free-flowing game of hide-and-seek in which I am always “it” and they constantly try to elude my grasp. Those who fail must endure a quick bout of sportive armpit prodding, belly kneading, and behind-the-knee squeezing. It’s fun. I spring out of the bushes and scamper after an unsuspecting pair of girls who freeze and shriek. The high-pitched emission continues as they quickly thaw and turn to run. In another round, I bide my time before bursting out from under the barbecue grill cover and then give chase. Later, I cut through the house and emerge from the garage just as all five of them seek respite between the vans in our driveway. Every once in awhile, I simply sprint around the house, rocket past whatever sentry they’ve posted, and overtake several in the midst of easing into their hiding spots. With the quarry fully surprised, I bear down on whoever is next on the running balance sheet I maintain in my head, mindful of spreading the proverbial wealth of “tickle shots” … cringing under the ear-splitting sound of the victim’s delighted squeals. All of this may conjure up imagery resembling what one might have seen decades ago on the television show Wild Kingdom … something involving a cheetah and a hapless wildebeest on the African savanna. I’d like to take it in another direction, though. In our game, my kids run and run and run from me until they sense individually that the jig is up. One of them becomes separated from the pack. She recognizes that I’ve zeroed in on her, and the distance between us is closing rapidly. She musters one last surge of energy and converts it into a few more panicky strides. But it’s never enough, delaying the inevitable by only a few seconds. So she slows down, pivots toward me, and then surrenders to “the tickle” while collapsing on the grass in a heap of giggles. This chase sequence repeats itself several times in the course of a game. It’s the moment of surrender that captures my attention. Having done their best to hide from me … having run hard and fast the instant they felt pursued … the girls ultimately turn to me–the goofy man with the wiggly fingers and the warm grin–and give themselves up. 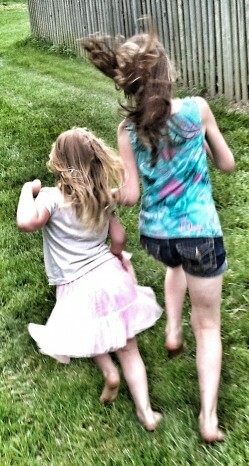 As much as they seem to fear falling into my clutches, they are relieved when the chase is over. Something they’ve known only in the back of their minds now shines in their awakened eyes. The pursuer’s hands wrapping around them tingle with mercy. The hunter is actually a shepherd, and surrendering means entering into a father’s joy. They abide in the sweetness of a solitary moment with their father … the others are still running and hiding while they are resting. True, they’ve been caught. But the deeper truth is that they’ve been found. And before they catch their breath and take to their feet once more, they remember the purpose of the game and what they really love about it.